Donau Front is part of the Central Front series of games that include: North German Plain, BAOR, Fifth Corps, and Hof Gap. Maps from all of the games may be linked and rules exist for a full Campaign game. 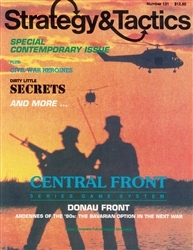 Donau Front is designed to depict hypothetical Warsaw Pact versus NATO conflict during the critical first five days of a future war. In May 1940, Hitler’s army unhinged the Allied defenses by striking though the Ardennes Forest. This heavily wooded tract has been pronounced unsuitable for tanks by the Allied high command, and thus was only lightly defended. By the time the Allies could react the German thrust, the panzers had spilled out onto the plains of France. In the event of another European war, could the Warsaw Pact take advantage of a similar situation? Rules are provided to link this game with Hof Gap.